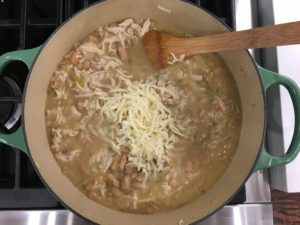 The addition of the Monterey Jack cheese makes this White Bean Chicken Chili the best I’ve ever made! This recipe came from a good friend who has been making it for years. Heat olive oil in large pot over medium high heat. Add onions and saute until translucent, about 10 minutes. Stir in garlic and chilies. Add cumin, oregano, and cayenne and saute 2 minutes. Add drained beans and stock and bring to a boil. Taste for seasonings, and add salt and pepper to taste. At this point, you can transfer the soup to a slow cooker or refrigerate until you are ready to serve it. Ten minutes before you’re ready to serve, add the cooked chicken and the cheese. Heat until the soup is hot and bubbly. Ladle into bowls and garnish with sour cream and additional cheese. TIP *I like to cook boneless, skinless, frozen chicken breasts in the slow cooker with just a little bit of salt and pepper. Cook on low for 4-5 hours, take out the chicken, throw it in the mixer, and shred it easily that way. Copyright © 2016 Our Everyday Dinners - This is an easy recipe for how to make White Bean Chicken Chili.